It’s time to prepare for warm weather, which means it’s time to break out the spring and summer outfits. Beat the sweltering heat by combining light layers in stylish ways. We have some cute warm weather outfit ideas for you to draw inspiration from. Reese Witherspoon, wearing leopard-print high heels, arrives by the back door at the Rossano Ferretti Hairspa, in a straw hat while talking on her cell phone in Los Angeles on May 1, 2014. Nothing says fresh quite like a basic cami top. Wear it with a skort for a summer vibe without the risk of an accidental windblown wardrobe disaster. Accessorize with a straw hat, a pair of ankle strap sandals and a crossbody bag for an outfit that boasts both form and function. Emma Roberts appears on Extra in Los Angeles on May 7, 2014. Fend off the heat by wearing a pencil skirt with a sheer lace overlay, which pairs easily with a bustier top. Depending on where you are going, you can wear it with a pair of pumps or a dressy pair of flats. Miranda Cosgrove has lunch at Fred Segal with a male friend in Los Angeles on May 1, 2014. If you’re facing an unexpectedly chilly day, opt for a light, cropped sweater. Wear it with your favorite pleated skirt and a pair of edgy summer booties to give it an unexpected twist. Lauren Pope leaving One Marylebone in London on April 23, 2014. Be chic and comfortable in a lace pencil skirt. A loose top would amp up the comfort level and would give your silhouette more volume. Diane Kruger and Joshua Jackson stay Hydrated at Coachella in Los Angeles on April 19, 2014. Striped tops are generally a staple that withstand all season. Wear yours with a more modern skirt, like a flared skirt, and then cap off the look with lace up sandals. 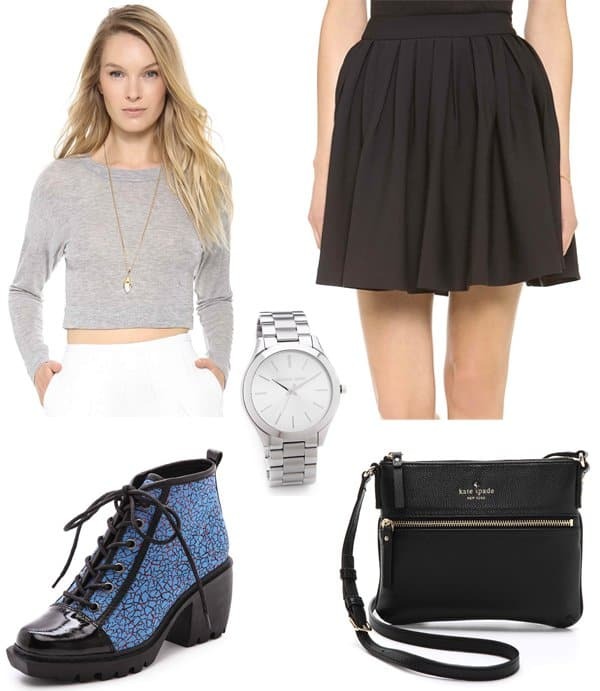 Try these easy outfits for superb casual style!